In 1998 Chérif Ghaly reached out on behalf of the ITU to find ways to demonstrate Internet technology during Africa Telecom. In the beginning, the idea was to provide Internet connectivity to the booths on the exhibit show flow – replicating the InterOp ShowNet. The specific needs of African’s Internet growth opened the door to dement how an Internet Exchange Point could be built in the middle of the ITU African Telecom show floor. 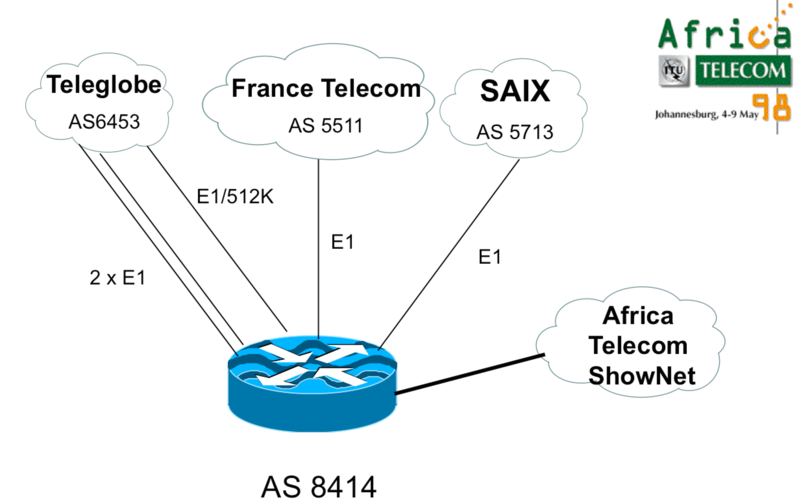 With the help of Cisco, Teleglobe, France Telecom, and Telkom South Africa, a IXP was built in a special booth – interconnected with the South Africa Internet Exchange Point (SAIX). Internet connectivity was provided throughout the exhibit halls along with special workshop on how IXPs work, how to establish them, and what needs to be done to facilitate their success.